Like most little kids, I used to love getting things in the mail. And in the 1990s, I was lucky enough to get something new every single day. Sadly, 99.9 percent of those were install discs from AOL. If you lived in the United States in the 1990s, you remember these. They started as 3.5-inch floppies and transitioned into CDs. And I’m not exaggerating. I got one just about every single day. You’ve got mail, indeed. If nothing else, it was ingenious marketing for AOL. While people eventually started bitching about getting spammed by the discs, most of those people probably also installed them at least once and checked out the service. So how much did that cost AOL? “A lot,” says CEO at the time, Steve Case. Case himself took to Quora recently to answer the question: How much did it cost AOL to distribute all those CDs back in the 1990’s? Case says that he doesn’t remember the total amount spent on the discs specifically, but says that in the early 1990s, AOL’s goal was to spend 10 percent of lifetime revenue to get a new subscriber. He says that since the average subscriber life was around 25 months, revenue was about $350 off of each of these users. So he guesses they probably spent about $35 per user on things such as these discs. “As we were able to lower the cost of disks/trial/etc we were able to ramp up marketing. (Plus, we knew Microsoft was coming and it was never going to be easier or cheaper to get market share.) When we went public in 1992 we had less than 200,000 subscribers; a decade later the number was in the 25 million range,” Case recalls. In other words, the discs worked. Case also notes that the subscriber growth helped grow AOL from a market cap of $70 million at the time of their IPO to $150 billion when the merger with Time Warner occurred. I repeat, the discs worked. Well, at least until that merger turned into a nightmare and had to be dissolved. A move which paved the way for the new-look AOL to purchase TechCrunch this year. 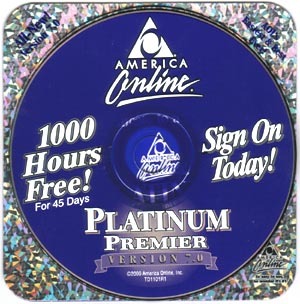 Another user on Quora looked over some numbers from the 90s and gave a more specific number for how much AOL spent on those discs: $300 million. As a side note, it’s great to see people like Case — who is usually pretty candid — answering questions directly on Quora. Humorously, it was SGN founder Shervin Pishevar who actually asked the AOL question in the first place. How do we know? Because he emailed us about it, overjoyed that Case himself responded. I think it’s very significant that people of influence are starting to flock to Quora as the authoritative place to communicate with the world in long form. Billionaire entrepreneurs like Steve Case (AOL) and Reid Hastings (Netflix) have already left important answers on Quora. Twitter is the leading place for short form broadcasting and short form blogging. Influential people are busy and don’t have the time to manage blogging on a continual basis and manage that community. Quora is quickly becoming the defacto community for such people to broadcast longer forms communications with the world and have it spread fast. We love Quora too. It leads to information like this.